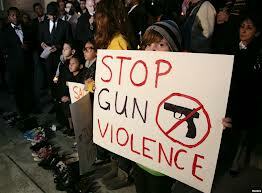 Support an Interfaith Gun Violence Vigil! I'm heading to DC on April 11 for an interfaith Gun Violence Vigil, marking all the GV Deaths since Sandy Hook. I (gladly) broke the Discretionary Fund bank on airfare. You're invited to support the trip by sending a gift to "Netivot Shalom Rabbi's Discretionary Fund // 1316 University Ave // Berkeley, CA // 94702"
Jewish Genetic Disorders Shabbat is April 12-13 (Tazria/Metzora) -- proud of my colleague and friend Rabbi Aaron Melman for leading this effort. May our children benefit in health and safety with every good decision parents make in advance with support like this. For more info, watch the video and also visit http://www.jewishgenetics.org/. JTA: "For some Israelis, a stay at Jewish camp opens eyes to religious pluralism"
TEL AVIV (JTA) -- After serving three years of mandatory army service, Guy Eisenberg felt like many Israeli military veterans: He wanted to get away and have some fun. Thailand or India would have been a natural choice. The countries are something of a rite of passage for Israelis seeking to blow off post-army steam. But instead of going east, Eisenberg went west and became a swim counselor at Camp Ramah in Wisconsin. He would return for six more summers to his wooded getaway, where he made lasting connections and discovered something even more fascinating than fun and new friends: ConservativeJudaism. "I had no idea about Conservative Judaism or anything different from Judaism in Israel," Eisenberg said. "I grew up religious. I studied in a religious high school with a religious family. It opened a world I didn't know." Other Israelis tell a similar story. Summers at American Jewish camps have opened their eyes to a much broader range of Jewish life. While small Reform and Conservative communities exist in Israel, most Israelis are either secular or Orthodox. Most secular Israelis have never attended daily prayers and don't observe Shabbat, while most Orthodox Israelis have had little if any exposure to egalitarian Judaism. "It was weird and hard at first, but I got used to it and liked it," said Dror Morag, a secular Israeli who worked with Eisenberg at Ramah Wisconsin. "It was a spiritual and cultural experience." Every year, approximately 1,500 young Israelis fan out to Jewish camps across the United States as emissaries, or shlichim, sent by the Jewish Agency for Israel. Their main task is to bring a taste of Hebrew and the Jewish state to American Jewish youth, but many come away with a deeper appreciation for different streams of Judaism and for American Jewish pluralism. "Many of our shlichim talk about the Jewish experience that they have in camp," said Eran Berkovich, the Jewish Agency's director of short-term emissary programs. 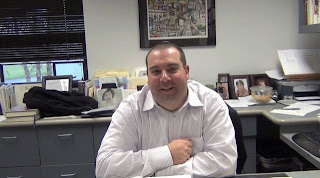 "It's a Jewish setting that allows them to evaluate their Judaism in a positive way. 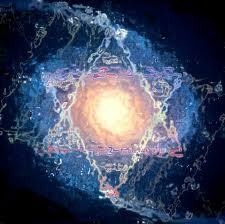 Many of the shlichim come back more pluralist." The emissaries say the immersive experience of camp gives them an intense introduction to American Judaism. "You take your Judaism as a given" in Israel, said Omer Givati, a secular Israeli who worked at North Carolina's Camp Judaea in 2005. "When you see that people choose to be Jewish, you can choose to connect to religion from another place." Although emissaries who go to Orthodox Jewish summer camps don't get the same exposure to liberal Jewish movements as some of their peers, they still encounter differences between American and Israeli Orthodoxy. American Orthodox girls "have a lot more knowledge of Torah, the weekly portion," said Adi Hershkovitz, an Israeli Orthodox woman who worked at Camp Nesher in Pennsylvania from 2006 to 2008. "They wore shorts, which we wouldn't wear. There's more emphasis on learning and less on how people look." The experience at camp doesn't necessarily change anyone's personal practice. Eisenberg didn't return to Israel and seek out the nearest Conservative synagogue. "I appreciate it, but I'm a lawyer," he said. "I don't spend time reading Jewish legal rulings." Some emissaries, though, said they came away from camp feeling more comfortable with and connected to their Judaism. "I respect the religion more and I'm more proud of Judaism because I can connect to it," said Givati. "Now I know the prayers, know what they say. I respect it because I understand it." Experiencing American Jewish pluralism has influenced the careers of several emissaries. Berkovich, Givati and Hershkovitz all worked for the Jewish Agency for a time in part because of their time at camp. Morag is the secretary-general of Meretz, a left-wing Israeli political party that advocates religious pluralism. Shai Bracha, who worked at Young Judaea Texas from 2007 to 2009, said the experience helped him find work as a staff member at the Alexander Muss High School in Israel, where Jewish students can spend a semester studying abroad. "A lot of people that age work being waiters or security guards or [other] easy jobs," Bracha said. "This one helps you advance your career." Givati said that working at a camp has helped him be a better Israeli. "Israel needs these shlichim like the U.S. needs them," said Givati, who now works as the Jewish Agency's partnership director. "Shlicihm that return to Israel are better Israeli citizens. It opens up your world to Jewish education." A Few Resources for Exploring the Notion of "Unfolding Torah"
New Adult Class: "Deepening Your Jewish Experience"
Do you bless your food with gratitude that a stooped worker picked it for you? Do you breathe in the rest of the Sabbath with ecstatic peace? Or, do you just wish you could? Join this conversation and explore how you can deepen your personal Jewish practice. We will explore three key areas: Shabbat, food, and prayer. Come exactly as you are and honestly determine what you would like MORE of in your life. Each person will be on their own journey but will share their questions and challenges. "Lean to the Left" or "Unshackled"
but beware of calming answers. next year there will be less need. My name is Stephen Barton, and I'm a survivor of the mass shooting in Aurora, Colorado. I want to tell you about something important that happened last night. This is a big moment, but it begs an even bigger question: Do we have 60 votes to pass gun reform in the Senate? Sadly, right now, the answer is no. And that's where you and I come in. Mayors Against Illegal Guns is organizing a National Day to Demand Action on March 28th. Senators will be at home for the Easter/Passover recess, and they need to hear from us. We need to attend events, make calls, and come together to make sure our elected officials don't give in to pressure from the NRA. Will you commit to calling your Senators on March 28th to support background checks and join the National Day to Demand Action? Background checks save lives and keep guns out of the hands of dangerous people. They are the single most import reform we can pass to stop 33 people from being murdered with guns every single day in this country. Yesterday, I joined Vice President Biden, Mayor Bloomberg and family members of victims from the Newtown shooting for a press conference about gun reform. The Vice President shared some emotional words with the families and some strong words of praise for the work Mayors Against Illegal Guns has done to keep the pressure on Congress. It made me feel proud. But it also made me want to get out there and make sure we pass this bill. I hope you will join me. We need 60 votes to make sure this bill moves forward, and your Senators are crucial to that total. Congress doesn't move fast, but when it moves, it's up to us to make sure it doesn't slow down or lose its nerve in the face of special interests. Thank you for fighting with me and all the other survivors and family members of victims who are working to end gun violence. P.S. -- Want to call your Senators right now? Use this call tool to connect immediately! 1. "Reid unveils outline of gun bill," USA Today, March 21, 2013. JCCPA: A package of new gun violence laws are making their way to the Senate floor. We're at a critical point! We are making progress: a package of new gun laws are making their way to the Senate floor. At this critical point, we need your help to urge Senators to support a comprehensive approach to ending gun violence! As we know, no one measure will solve our country's gun violence problem. A comprehensive approach must include provisions to stop gun trafficking, require universal background checks, increase access to high-quality mental health services, ensure school safety, and a ban on assault weapons and high capacity magazines. Each of these is important to the comprehensive approach we have called for, but already one of these pieces – the assault weapons ban – is facing serious challenges. Senator Feinstein plans to offer her assault weapons ban as amendment to the larger gun violence legislative package that is scheduled to be considered by the full Senate next month. This is an extra hurdle that will make the ban less likely to pass and weaken our comprehensive approach. Still, there are so many loud voices for an assault weapons ban. Vice President Biden, who joined us by video at the JCPA Plenum, recently explained that the White House has not " given up" on the ban. Together, we can be heard and make a difference. Another piece of a comprehensive approach is requiring universal background checks. Recent public opinion polls show broad support (80% and up) for universal background checks on firearms purchases. Currently, if guns are sold at gun shows or through private sales, no background check is required. That is approximately 40% of all guns purchased in the United States. Criminal and mental health reviews are a straight forward way to help prevent guns from getting into the wrong hands. In speaking to the JCPA Plenum last week, Sen. Richard Blumenthal (CT) warned of the uphill battle comprehensive gun violence legislation will face and encouraged each of us to take the lead in building support for this legislation in our states. Join us and take action by encouraging your Senators to support comprehensive gun prevention legislation! When we come together and raise our voices, Washington will listen. Share this with your friends and family and encourage your Senators today to show your support for comprehensive legislation! Minyan Monday Morning 7:15 am in the CNS Library, followed by a siyyum (completion of learning) with Rabbi Dorothy Richman! "Modern Slavery Seder Supplement" created by CNS Members Leslie Gordon, Joel Siegel, Mark Priven, and Robin Braverman. MoveOn.org: "congressional Democrats, led by Majority Leader Harry Reid, are on the verge of caving on the three most critical gun violence prevention proposals"
After months of promises that, in the wake of Newtown, this time would be different, congressional Democrats, led by Majority Leader Harry Reid, are on the verge of caving on the three most critical gun violence prevention proposals: universal background checks, a ban on assault weapons, and a ban on high-capacity magazines. What's looking most likely to end up in the final bill? A provision encouraging guns in schools. No, no, no. MoveOn members and our allies have done so much to make real reform possible—with tens of thousands of phone calls, events, lobby visits, letters, and pleas from victims' families. We've come too far to let meaningful gun violence prevention measures be killed by the NRA's backroom lobbying, Republicans' perpetual threats of filibustering, and Democrats who won't stand up and fight. Can you chip in $5 to our emergency campaign to double down on our work for real gun violence prevention legislation? Click here to contribute $5 right now. Support powerful state and local anti-gun-violence campaigns, like that of a MoveOn Community Committee Against Gun Violence in Tucson, AZ, which organized and won a ban on gun shows in Tucson that don't guarantee background checks for all sales.5 They're ready to take this demand statewide, and other communities are ready to follow their lead. Can you contribute $5 to end gun violence? We've seen congressional Democrats try to back down from a fight before—only to have the grassroots inject a dose of backbone and show them how it's done on the state and local level. MoveOn leaders are running campaigns in places where opponents to reform—Republicans and Democrats—think gun laws are untouchable. We're actually winning on the state and local level. In addition to Tucson, Colorado just enacted significant background check reforms.6 We need to push those victories to other states, and use them to push leaders in Washington to turn the tide. Pitch in $5 right now. The annual JCPA Plenum wrapped up last week with representatives from the JCPA's 125 Jewish community relations councils and 15 national member agencies meeting with Senators and Representatives on Capitol Hill to discuss guns, the budget, Iran, and immigration reform. The meetings in Congressional offices and at the JCPA reception came at the conclusion of a three-day symposium where Jewish community leaders met with national experts and policy makers to discuss these issues and other Jewish community priorities. In addition to the Members of Congress on Tuesday, the JCPA Plenum heard from Homeland Security Secretary Janet Napolitano – with a special video introduction by Vice President Joe Biden – on the need for immigration reform and the Administration's proposals. Earlier that day, JCPA President Rabbi Steve Gutow sat down with Sister Simone Campbell, Executive Director of NETWORK, a National Catholic Social Justice Lobby, and Reverend Jim Wallis, CEO of Sojouners, a national Christian organization, for a discussion of how our shared faith can motivate our communities towards social action. And as President Obama prepared for his arrival in Israel today, Israeli Ambassador Michael Oren and the Atlantic's Jeffrey Goldberg had an interview-style conversation about the itinerary and the US-Israel relationship. These are just a few of the highlights from Plenum, which also included seminars and workshops on social media and Israel advocacy. Plenum delegates also voted to welcome Jewish Women International as our 15th national member agency and approved new resolutions on fair pay for women and the need for comprehensive gun reform. You can read more on the Plenum from the JTA here. The Senate is preparing to consider a package of gun violence bills recently approved by the Judiciary committee, including a bill on gun trafficking, universal background checks, a measure to increase school safety, and a ban on assault weapons. Each of these is important to the comprehensive approach we have called for, but already one of these pieces – the assault weapons ban – is facing serious challenges. Sen. Diane Feinstein (CA), the assault weapon ban's sponsor, has said that Senate Majority Leader Harry Reid (NV) will only allow the bill as an amendment to the gun violence package that will be sent to the floor next month. This is an extra hurdle that will make the ban less likely to pass and weaken the comprehensive approach we have called for. In speaking to the JCPA Plenum last week, Sen. Richard Blumenthal (CT) warned of the uphill battle comprehensive gun violence legislation will face and encouraged each of us to take the lead in building support for this legislation in our states. Join us and take action by encouraging your Senators to support the assault weapons ban, "like" us on Facebook to help spread support and information on gun violence, and if you're on Twitter, send a message to @SenatorReid to ask for a comprehensive #VoteOnGuns. 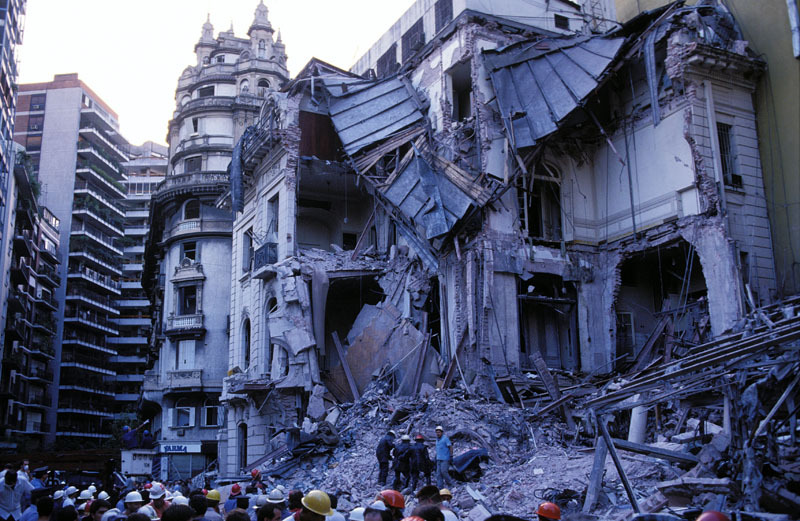 Last Sunday, March 17, marked the 21st anniversary of the terrorist bombing of the Israeli Embassy in Buenos Aires, Argentina. Among the 29 people killed in the attack, widely believed to be the responsibility of Hezbollah, was Deputy Chief of Mission David Ben Raphael. Thus far, no one has been brought to justice. Nor has anyone been brought to justice for the attack that took place two years later in Buenos Aires on the AMIA Jewish community center building that resulted in 85 deaths. The JCPA and others have strongly condemned a so-called "truth commission" recently established by Argentina and Iran, and Interpol is not dropping its arrest warrants for Iranian officials wanted in connection with this atrocity. You are encouraged to communicate with the Argentinian embassy in Washington, DC and local consulates to urge that authorities continue to investigate both of these terrorist attacks in an effort to bring all the perpetrators to justice. The Case for Incrementalism: Ahead of President Obama's trip to the Middle East, JCPA's Martin Raffel says the best hope for peace is not all or nothing, but the incremental state-building of PM Fayyad. Violence Against Women Act: Last week, President Obama signed an expansive reauthorization of the Violence Against Women Act, with Jewish leaders, including the JCPA, in attendance. Jews and the New Pope: Jewish groups welcomed the selection of Cardinal Jorge Mario Bergoglio as Pope Francis. JCPA President Rabbi Steve Gutow said he saw in this Pope the opportunity for deeper cooperation on social justice issues. This is Our Homeland: The Baltimore Jewish Times reports on Israeli Ambassador Michael Oren and The Atlantic's Jeffrey Goldberg's conversation about the President's trip to Israel at the JCPA Plenum last week. Hunger Seders: This Wednesday, the 5h annual JCPA/MAZON Hunger Seder mobilization kicks off. With 28 events around the country, including at the US Capitol, the Hunger Seder ties the Passover message of freedom from oppression to the ongoing problem of hunger in our country. Monarch in the Middle: Jeffrey Goldberg talks to Jordan's King Abdullah, the most pro-American Arab leader in the Middle East, in this excellent profile in The Atlantic. Remember the Triangle Fire: Labor Unions, the NYC Fire Department, the NYC public schools, and others are holding an event in New York to remember the 1911 fire at the Triangle Shirtwaist Factory. The Jewish Council for Public Affairs (JCPA) is the united voice of the organized Jewish community. For more than sixty years, the JCPA has identified issues, formulated policy, developed strategies and programs, and given expression to a strongly united Jewish communal voice. JCPA's has an unparalleled capacity to mobilize grassroots activism, through our network of 14 national and 125 local member agencies. The JCPA serves as a catalyst that heightens community awareness, encourages civic and social involvement, and deliberates key issues of importance to the Jewish community. To learn more about the Jewish Council for Public Affairs, please visit our Annual Report. To unsubscribe from this list or adjust email preferences, please click update profile. To stop receiving all JCPA emails, please click unsubscribe. New Yorkers Against Gun Violence Rally - this Thursday at 4:30pm! Join New York Voices Against Gun Violence for a massive mobilization to focus attention on the human toll of the gun violence that is plaguing our nation, and stand up for common sense protections such as background checks on all gun sales and a ban on assault weapons. We will be promoting the NY SAFE ACT, which Governor Cuomo signed into law recently, as a model for legislation at the federal level and in other states. Together we can keep our children and our communities safe! We are a broad coalition of advocates, youth organizations, healthcare workers, unions, elected officials, faith leaders and artists who have come together to reduce gun violence. Members of our coalition include: Moms Demand Action for Gun Sense in America, New Yorkers Against Gun Violence, Million Mom March of New York, The Brady Campaign to Prevent Gun Violence, Harlem Mothers S.A.V.E., 1199 SEIU United Healthcare Workers East and Doctors for America of NY State. The NRA's list of "National Organizations, Individuals & Celebrities, Corporations, Publications and Media Outlets With Anti-Gun Policies"
Friends, what do we do with this list, generated by the NRA's "Institute for Legislative Action"? Obviously, it shows overwhelming support for sane Gun Violence laws. It also shows the NRA is scared AND very well-organized.... feel free to pass this whole message, the question, and suggestions along! The following organizations have lent monetary, grassroots or some other type of direct support to anti-gun organizations. In many instances, these organizations lent their name in support of specific campaigns to pass anti-gun legislation such as the March 1995 HCI "Campaign to Protect Sane Gun Laws." Many of these organizations were listed as "Campaign Partners," for having pledged to fight any efforts to repeal the Brady Act and the Clinton "assault weapons" ban. All have officially endorsed anti-gun positions. RSVP by Wednesday for the CNS 2nd Night Seder!! Fair Trade Chocolate You CAN Eat on Passover!! !